BullGuard Identity Protection is simple and is an effective way to protect yourself from identity theft, to keep your personal and financial information safe, whatever devices you use to access the Internet. Advanced technology that safeguards you 24/7 by continually monitoring the internet for your personal information. Continually monitors the web, social networks and the deep net where personal data is traded; searching for private information, including: credit and debit cards and bank account numbers, driving licence, passport and national insurance numbers, phone numbers, email and postal addresses, usernames and passwords. Simply list the details you want to protect and the moment we detect your information has been compromised, we notify you via email or SMS to help prevent fraud and identity theft attempts. Access your account online from any device, any location and anytime. 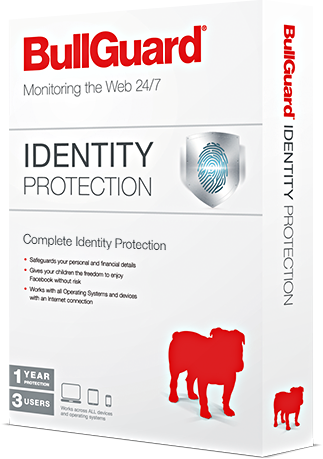 BullGuard Identity Protection is a web-based service so you don’t need to install anything on your computer. This means you have you fast and easy access to Identity Protection or Social Media Protection, from any internet-connected device, regardless of platform: PC, Mac, iPhone and iPad and other types of smartphones and tablets. You can pay annually or monthly, whatever suits you. We’ve bundled this advanced technology and ease of use with affordability. You can now benefit from effective online identity protection for your entire family, according to your needs and budget – opt for a monthly subscription or save more on a yearly one! Free support whenever you need it. We’ll help you with any problem you may have, via Live chat or e-mail. This service is available any time of the day or night. You can also choose online remote access support, if it makes thing easier for you. PC, Mac, Android, iPhone, iPad and other types of smartphones and tablets. Internet Explorer 8 or higher, Mozilla Firefox, Google Chrome, Safari, Opera. Territory coverage: This product is only available for US, UK,Canada, Denmark, Germany, France, Ireland and Netherlands residents.